French architects Guérin & Pedroza turned part of an abandoned old war building complex into a brilliant, gold-clad apartment building. Part of an impressive urban design renovation of the Issy-les-Moulineaux fort, the complex was originally built to protect the French capital from the Prussian invasion. Today the complex is undergoing a radical "eco-district" transformation that is a collaborative project between local government, developers, urban planners and various architects. Once the desolate land was bought by the municipal government in 2010, individual building plots were sold to local developers, and the community areas around the old military fort were installed with green space, a swimming pool, fitness trails and even a community bowling field. In total, the complex has 18 blocks of residential flats, a child care center and two schools. Guérin & Pedroza worked on one of the four blocks owned by French developer Bouygues Immoblier. This section has been nicknamed the “Digital Fort” thanks to the optical fiber cables and home automation system installed throughout the buildings. Although the volume and shapes of the buildings within the renovation plan were created by Architecture Studio, who won a competition to oversee the entire project in 2000, Guerin & Pedroza provided the project with an incredible and unequivocal standout identity. The architects distinguished each apartment building from the rest by carving out multi-sized balconies and terraces and covering the open exterior spaces in a luminous gold cladding. 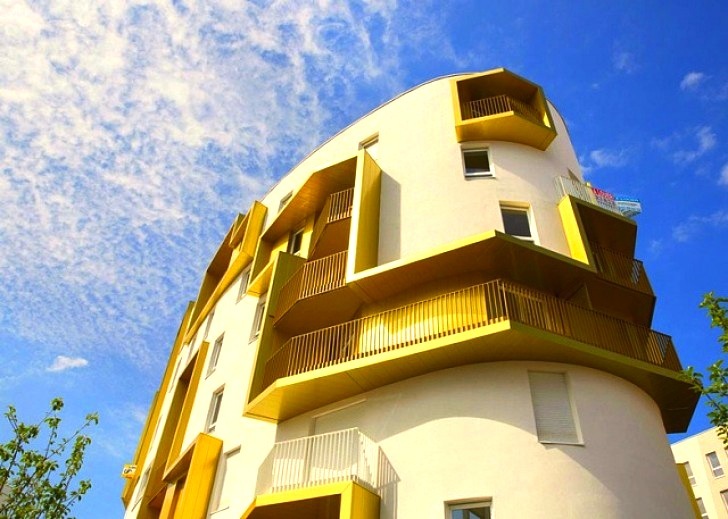 The golden building is made up of 74 low-energy apartments ranging in size from single room studios to five bedrooms. For energy and water conservation, the hot water and heating systems use geothermal energy provided by two 700 meter deep wells and heat pumps. A pneumatic removal system controls waste collection underground, eliminating the need for large waste collecting trucks passing through the area. Once the desolate land was bought by the municipal government in 2010, individual building plots were sold to local developers and the community areas around the old military fort were installed with green space, a swimming pool, fitness trails and even a community bowling field. In total, the complex now has 18 blocks of residential flats, a child care center and two schools. 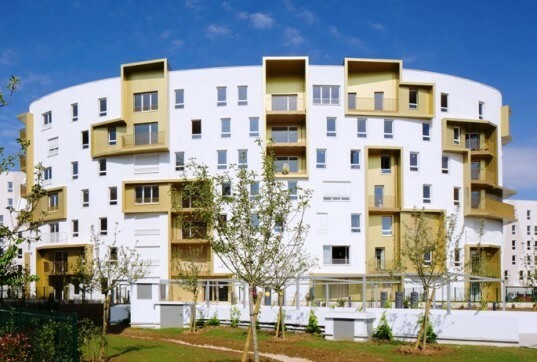 Guérin & Pedroza worked on one of the four blocks owned by French developer Bouygues Immoblier. The golden apartments are part of a section that has been nicknamed the “Digital Fort” thanks to the optical fiber cables and home automation system installed throughout the buildings. Although the volume and shapes of the buildings within the renovation plan were created by Architecture Studio, who won a competition to oversee the entire project, Guerin & Pedroza revamped their contribution to the project by giving the white apartment building an unequivocal standout identity. The architects were able to distinguish individual apartments by carving out various-sized balconies and terraces and covering the open exterior spaces in a luminous gold cladding.